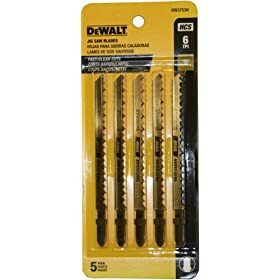 The DeWalt 4-inch Cobalt Steel 6-Teeth/Inch T-Shank Jigsaw Blades are ideal for use on fine woodworking. The blade size makes them ideal for making precise, intricate cuts, and with its reinforced tooth design made from tough carbon steel, the blade will last longer than standard blades. The built-in side chip path helps to quickly remove debris and clear the kerf for cleaner and smoother cuts. In general, lower tooth counts are used for wood (up to 12-teeth-inch), and the higher tooth counts are used for cutting metal (14-36-teeth-inch). Note: Please make sure that you choose the proper shank to fit your jigsaw. Jigsaw blades are either Universal Shank (fits most Black & Decker, Skil, and DeWalt saws) or Bosch Shank (fits most Bosch and DeWalt saws). These blades are some of the best I've found. They do a great job on wood or metal. The design of the teeth keeps them from breaking while using them on metal, while still giving a quick smooth cut on wood.